Derek was inspired to turn down the DC offer after speaking with a young boy who just lost his father. He couldn't bear the thought of being so far away from Meredith and his kids. But Meredith reacted to this news by saying she needs a drink. 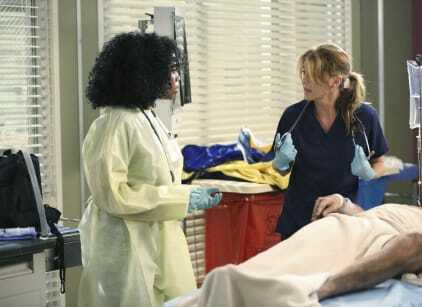 Why the long face, Mer? Alex clashed with Bailey over the board seat, as that issues will be left to other board members to vote on. Every guy, humorously, tried to befriend a lonely Owen, who insisted he was fine. Callie decided she wanted to have a child through surrogate, but Arizona said she may want to do a fetal surgery fellowship, which would take up all her time. Trouble could be afoot for these two.